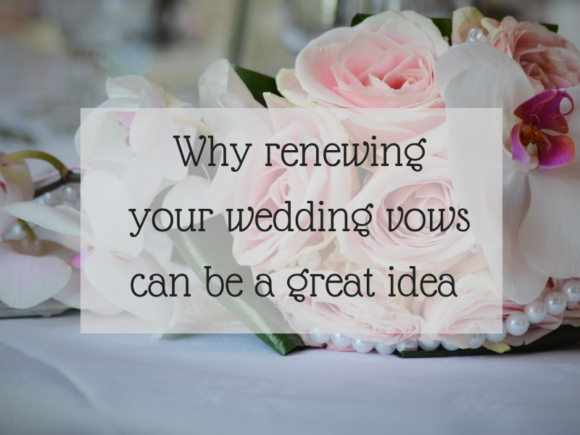 Have you ever thought about renewing your wedding vows with your spouse? I must admit it has crossed my mind, as in two years time we will be celebrating our 20th wedding anniversary. But why renew your vows? Well, everyone has a different reason. There is no legal or tax advantage to renewing your vows, and it could be considered a nice thing to do. Especially as a means to celebrate an upcoming marital milestone, or to help you show the other just how much they mean to you. Perhaps it would be a nice thing for your children to see, or perhaps you’ve been inspired by the recent marriage of your own children. But don’t let us give you the wrong impression, you shouldn’t have to justify any expression of your love with your partner. Sometimes you might just want to, and that’s more than enough. But if you desire further justification, then it could be good to consider the following. Let us not forget the excellent celebrations you might have. A celebration after renewing your vows, will mean that you are surround by friends and family. This can lead to a great evening or afternoon, perhaps even a second honeymoon. Arranging time in a beautiful space, using the Alive Network for entertainment options, and booking a free bar can lead to a hilarious and memorable time. You only get so much time in life to tell another you love them deeply. So why not do so in the most celebratory, ceremonial and loving manner possible? Why not make an event of this? If there’s anything you should be allowed to celebrate at the drop of a hat, love probably comes in quite high. This shows that no matter what life has thrown at the both of you, and no matter what happens in the future, or how much time you have left to love, you will have celebrated it brilliantly when you had the chance. With these simple pointers, you might find that you are booking in your wedding renewal sooner than you think.